This will be a good reference in the Philippines where many cities are in need of transformation to address current and future challenges in transportation. Planners, engineers and students should read this and use it to make our streets safer and more efficient in terms of mobility for all. It would be nice to see fresh ideas on how we can improve our streets not just in Metro Manila but elsewhere across the country. Of course, it would be nice if city planners of local government units (LGUs) can adopt this design guide parallel with efforts to improve public transport services. It should be understood that simply imposing lane allocations and traffic flow policies (one way? ), for example, will not solve problems but may create more. The approach should always be integrated, inclusive. In other words, complete. My students recently concluded studies on popular ridesharing/carsharing services Uber and Grab. The studies details how, for example, people have come to prefer Grab Taxi, Grab Car and Uber over regular taxis. One important finding and conclusion in one study is that Uber and Grab in the Philippines cannot be considered as contributing to sustainable transport. Note that this conclusion is just for the Philippine case and perhaps can be further constrained to Metro Manila since all data collected was with the geographical bounds of the metropolis. There is already a perception that there is an oversupply of vehicles being used for what is being claimed as ride-sharing or car-sharing. This is due to the surge in new vehicle purchases as people joined the Grab/Uber bandwagon. Who can resist the opportunity to earn good money from being a Grab or Uber driver? That is basically the question answered by a lot of people who decided to purchase cars and register these and themselves for Grab or Uber. To see if there is some truth to this perception of oversupply, we use one ride-sharing app for the information it provides users. One can make a quick check of how many Grab vehicles are moving about and ‘looking’ or waiting for riders/passengers. Following are what’s displayed on my phone in three random instances last Tuesday for GrabCar. I leave it up to the reader to draw conclusions from these screenshots. My colleagues and I have been talking about accomplishments and legacies. In particular, we had a spirited discussion about what we have been doing in terms of transportation projects that we have been involved in. I think everyone wants to have something physical to remember them by. And these should be positive and constructive and not memories of controversies or anomalies like those in major projects that will be associated with corruption or abnormalities in the processes by which the projects were implemented. The ‘problem’ with being involved in policy making and planning is that these often lead to outputs such as reports and maybe even laws. If one is lucky enough then perhaps its in the form of a legislation rather than a Department Order. But those legislations and memos often do not acknowledge the people who contributed to its drafting. They will be associated with the politicians (e.g., senators and congressmen) and officials (e.g., secretaries, undersecretaries) who sponsored, co-sponsored or issued them. It will be good to have some sort of evidence to show and prove that you were instrumental in planning, designing and/or implementing a project. The lead for these projects was Dr. Ricardo Sigua who is the one of the leading transportation engineers in the Philippines and currently the Director of the Institute of Civil Engineering of the University of the Philippines Diliman. He is also the head of the Road Safety Research Laboratory of the National Center for Transportation Studies where he is also a Research and Extension Fellow. Others involved in these projects were Dr. Karl Vergel, Dr. Noriel Christopher Tiglao and Dr. Jose Regin Regidor, all from UP Diliman and affiliated with the NCTS. 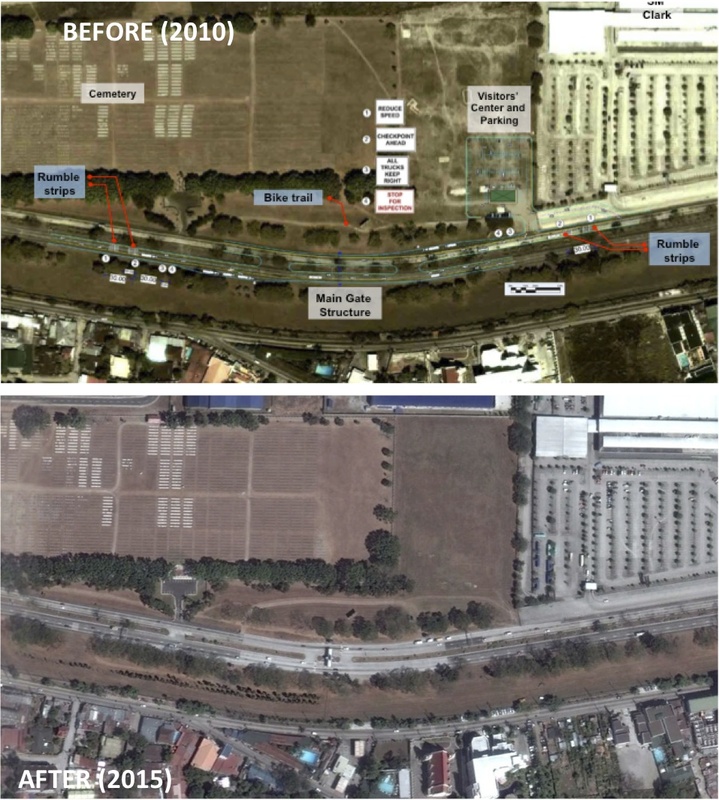 The Department of Public Works and Highways (DPWH) embarked on a major road widening project in the last administration. This continues today. One of the issues raised then was the cutting down of many trees along the roadside to give way to one additional lane along each direction of national roads. While conservationists and environmentalists were not successful in provinces like Tarlac where old camachile trees were cut down, the case in Pangasinan seems a bit more positive. Traffic along rural highways such as the Urdaneta-Calasiao-Dagupan Road can become heavy but not so much so that it requires two additional lanes to the original two. As such, while the shoulders can be paved as part of the lane widening program of the DPWH, the trees can actually be spared. I think the DPWH and the LGUs would just need to mark the trees to make them very visible at night time or when visibility is low along the highway. Big old trees, mostly mango trees line up the Urdaneta-Calasiao-Dagupan Highway along the newly paved lane that used to be a shoulder of this highway. These huge trees are fruit bearing and so one can imagine that part of the loss if these were to be cut down were the tons of mangoes that many people could benefit from. Sections of the additional lanes are generally not usable for general traffic and revert to their previous use as parking spaces. These paved sections now also are useful as ‘solar driers’. Shown in the photo above is an example where grains of rice (palay) are laid out direct on the concrete pavement for natural drying under the sun. People (staff of the owners) guard these against animals, wayward motorists and possibly thieves. These staff will gather the grains when there is impending rains or when the day’s almost over to dry another day. I wanted to take more photos of the highway but was seated at the back of our van so I had to settle for a few select shots. The second photo above is care of a colleague who sat in front and took a few shots himself.